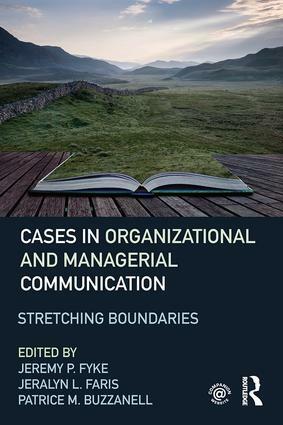 Stretching Boundaries: Cases in Organizational and Managerial Communication focuses on non-traditional organizations in a variety of contexts. Because cases range from small family-owned entrepreneurships and cybervetting to provincial egovernment democratic movements in China, this supplemental text enables a reexamination of the boundaries of traditional organizational contexts. Cases delve into organizing structures, relationships, and visions for global not-for-profits, hybrid, creative industry, and entrepreneurial organizations. This book stands to benefit instructors and students in at least four ways. First, it provides instructors with an application-based teaching tool to help spark discussion. Second, students will find the case studies interesting and applicable to their future work lives, especially undergraduates who will soon be in the work force. Additionally, cases help students grasp course materials that may be otherwise challenging. Finally, for graduate students, the book encourages reflection on important topics for future research. Finding the Right Fit. Online? Organizational Culture or Organizational Cult?